There's always got to be that one guy at the tailgate who wears full-body Carhartt work gear. Listen, if Philadelphia had been on the verge of clinching a hometown Super Bowl appearance, and the opposing team's fans had danced all over the graves of our hopes and dreams when they turned to nightmare, Birds fans would have been just as triggered as their peers from Minnesota. LOL. J/K. No, they wouldn't have. Even though many are adults who act like children, they have a level of dignity and pride that would prevent them from whining like babies in pursuit of mother's milk. Did you know there are also some really good Philly fans, too? In most cases, they don't get nationally regurgitated attention, but they should! So on the eve of what could be the first-ever Eagles Super Bowl victory, why not take a little time to give them the credit they deserve? With the two-minute "Eagles Fan Video 2018" embedded below, he went a long way toward providing evidence to prove the haters wrong. Less than two weeks ago, the 42-year-old suburban man and "a 10-pound baby born in India who grew up an Eagles fan" risked decapitation by subway. He did so in an effort to rally fellow fans WHO WERE ON A TRAIN LEAVING THE STADIUM AREA. It would have been easy to write him off as yet another unhinged maniac, but when Desai spoke to the world in the aftermath of the viral moment, he was introspective and – dare I say – worthy of respect. "The passion will always be there, but maybe I could bottle it up a little bit, pace myself a little more while pregaming and save all that energy until I get to the stadium. I want to move forward that way. Hopefully, I brought a lot of laughs to people all over the world. I think we all need to laugh more, and my friends are having a great time with this. "My wife and I haven't shown the kids the video yet. I want to be a good role model, but the lesson here is that these things can get recorded and is this how you want to represent your passion? When we tell them in 10 years or something, we'll have a good laugh, though." In the wake of the mayhem surrounding the NFC Championship game, some Eagles fans followed the lead of other fanbases insofar as they sought out charities with ties to the opposition and sent some coin its way. In this case, it was The Mike Zimmer Foundation, which saw thousands of dollars start rolling in last week. Created by the Vikings head coach to honor his late wife, the foundation aims to "better lives of children in need by helping them chase their dreams, motivating them to do so and promote a healthy and active way of living as well as stress the importance of education, hard work, and teamwork." Here's how you can donate, too. On Monday, Gary Kelmer got to the last stop on his school bus route and saw a few dozen people sporting Eagles gear. What the staunch Birds fan was about to learn was that some 100 people chipped in for a "Send Mr. Gary to the Super Bowl" GoFundMe effort to, well, send Mr. Gary and his wife to the Super Bowl. It's a one-day trip, but a memory that will last a lifetime. "I don't know what to say," he told the Burlington County Times. "This is a special dream come true. I've never had anything like this happen to me. Never." 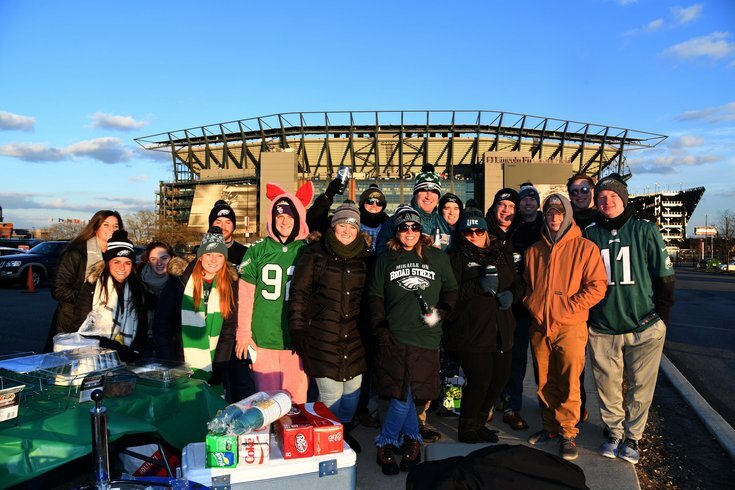 In a move that helped stanch the flow of hate toward the fanbase as a whole, 33-year-old Chris Muller – of Harrisburg by way of Bucks County – posted video to Facebook of Eagles fans being gracious in victory to Vikings fans at the Linc. "My aunt tapped him and said, 'See, not all Eagles fans are a**holes,'" he told PhillyMag after the video went viral. Like many iconic Philadelphians, Larry Poff's story is one of a comeback. Whether he was complaining about the Eagles' performance or expressing unbridled confidence for an upcoming game, he delighted viewers in the mid-2000s with his inebriated rants on then-CSN Philly. His celebrity status faded but was revived this season after a now-infamous clip of him calling former Eagles quarterback Jeff Garcia "our baby" went viral, thanks to Jeff McDevitt's Twitter crusade. Poff has since become an unofficial mascot for Eagles Twitter, and has been mentioned and interviewed in national sports publications. Personally, exchanging messages with Poff before and after the games since our October interview has been a highlight of an incredible season. Long live The Poffer (who you can follow on Twitter now, by the way). This pair of police horses was just doing their jobs outside Lincoln Financial Field when the Eagles were playing the Atlanta Falcons one week and the Minnesota Vikings the next. Then, out of nowhere, they were allegedly punched in the face by ornery fans. While we don't know whether non-humans actually know they're rooting for people-sports teams, these two made a sacrifice to help keep the peace outside the Linc. 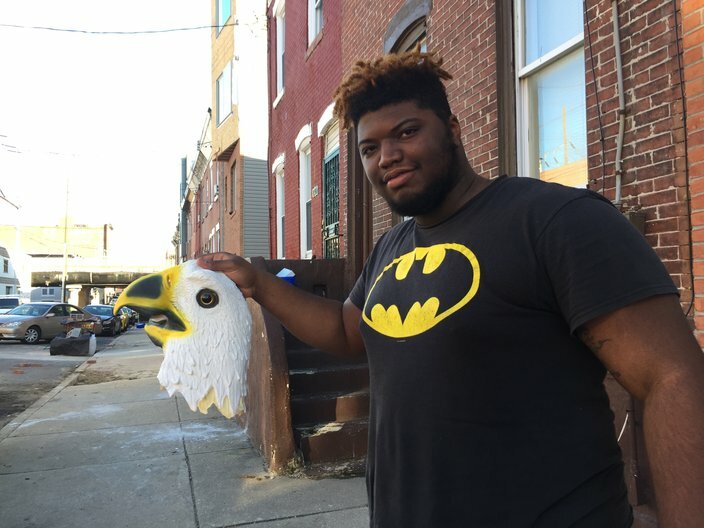 The second the Eagles were done curbstomping the Vikings, 18-year-old Nyseem Porter ripped his Rick and Morty T-shirt off, put an Eagle mask over his face – since the underdog masks were all sold out – and headed out onto the streets of South Philadelphia. He offered high-fives, selfie opportunities with fellow fans and the sort of unique passion that outshined an image of a man riding down the middle of Broad Street atop a vehicle. When we spoke with him last week, we were struck by how passionately normal he was. A good kid with a bright future. Nyseem Porter said the whole experience has left him 'dumbfounded,' but has big, secret plans should the Eagles beat the New England Patriots in the Super Bowl. Should the Eagles win on Sunday? "I have something big planned, but I can't tell you what's going to happen," he says. Here's hoping we all find out what that is. The children ARE the future. Specifically, the future of Philadelphia Eagles fandom. And in these two instances, they GET it. The 69-year-old man from Upper Darby has had Eagles season-tickets since he was 24. He was recently part of an NBCPhiladelphia segment about Big Eagles fans, a segment which included a dude who said he'd give his knee to injured quarterback Carson Wentz. 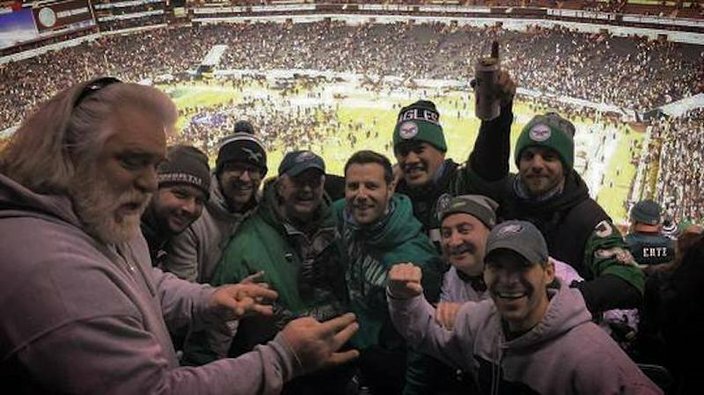 In this photo that appeared on social media after the NFC Championship game, longtime season ticket holder Gerry Woods (fourth from left) is surrounded by fellow Eagles fans at Lincoln Financial Field. His son Pat told me that Gerry has 24 tickets under his name and sits with a regular crew each home game. "They all met at the Vet and requested seats nearby at the new place," he said. "In all those years, he's never had a problem with fights and makes sure no one with tickets under his name does either. "If you want the real story of the folks that go to watch the game, it's him. Nose-bleed seats, binoculars, newspaper clipping of both teams rosters and headphones for news since he doesn't have a smartphone. He's the real deal fan." PhillyVoice writers Daniel Craig and Matt Mullin contributed to this article.